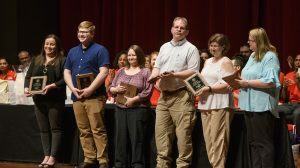 Nominations for the 2019 award are due by 5 p.m. on Tuesday, May 7. 2019. 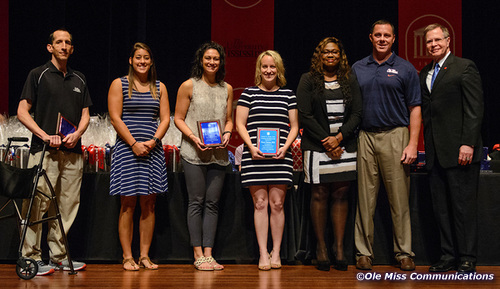 The Outstanding Team Service Award was created to recognize and honor dedication and outstanding contributions by a University of Mississippi team of employees. The award will be given annually with a plaque for each team member. The award will be presented at the spring Staff Appreciation awards ceremony. Nominees must be full-time or part-time employees of the University of Mississippi. Nominations should be for groups of two or more staff members who work together toward a common goal or mission, who have gone above and beyond in their service to the university. A selection committee composed of the Executive Committee of the Staff Council and other personnel will meet to discuss and decide on a winner from the pool of potential candidates provided. Nominations can be submitted to staffcouncil@olemiss.edu or delivered to Jackson Avenue Center, Room L06. Nominations for the 2018 award are due by 5 p.m. on Tuesday, May 7, 2019. These criteria address employee achievements in programmatic effort that have an impact primarily at the department/school/county level within the University of Mississippi.